It was on the morning of the twentieth day on the farm that Paul woke and sat up, rubbing his face with an arm that barely hurt. In the other room the grandmother was coughing horrendously and he could hear Tani try and coax her into taking a potion. Sighing, Paul glanced over at the silk doublet Tani had repaired for him. It lay folded on a chair with his boots, which were brushed clean. I don’t belong here any longer, he thought. I don’t belong at home either. He crossed the distance to the clothes and picked up the doublet, looking hard at the black raven on the shoulder. His father once told him that they bore the raven because they kept watch for the dead, the bones of nobles were to be stored in noble graves, and those noble graves existed beneath Hallow Hill. The catacombs delved for miles beneath the earth, the bones of heroes both old and new lay silently there, a reminder of what nobles were to be: grand in life and quiet in death. Their stories were written in stone beneath their deathbeds. Already one awaited his father. But none will wait for me, the coward of King’s Road. “I’ve done my share of work,” he pointed out and her cheeks reddened. “Aye,” she said, frowning and opened and closed her mouth several times as if to speak. Paul smiled and Tani blushed deeper. She is pretty when she blushes. “No, not here,” Paul confessed and pulled his white, linen shirt over his head and tied it shut. It fit him well, even if had been her father’s. “Do you read?” she asked, blinking. Paul laughed and smiled, feeling suddenly very free. The elation was intoxicating and he found the laughter wouldn’t end. It felt wonderful to think of a future where he was not compared to his father, not made to feel like a failure. In Star Fall he could study, become a scholar. He might even do something meaningful, like record the history of Aranor for all to read. Maybe I’ll read it to Tani one day. Thinking of her like that made him feel awkward and he looked away from her stare. She probably thinks I’m mad. “Of course I read,” he said and slipped into his boots. “Don’t you?” She shook her head and moved to place the bread and cheese on the empty chair. “Father said he would teach me but…” But he never did, Paul thought. Or never got the chance. He touched her shoulder and she blinked up at him. “I could teach you?” he suggested. For the longest time she just stared at him. Her skin was warm beneath her simple dress, her hair pulled up into a knot, revealing a slender, sloping neck. Freckles fell in speckled waves down that neck to her shoulders. In the flecks of orange he thought he could see the warrior’s constellation but resisted the urge to trace it. Finally she pushed his hand away. The day was warm but overcast, and a light drizzle set the air to mist. Together they opened up the barn, hauling the huge doors aside. Inside, the hay smelled damp and revolting but Tani didn’t seem to notice or care. She was oddly quiet as they worked, not saying a word even to insult him. After they fed the cows and Paul gave their horse a good rub down, he finally had enough of the silence. “You can’t,” the girl said. There was something in her voice that made him pause. It sounded off, bittersweet may. And then she fell to her knees and sobbed. Paul stood there silently, the brush for the old bay in his hands. He wanted to say something but it got stuck in his throat. The old woman had known who he was and offered him food and shelter. She’d offered what she herself could have used instead. All because I’m Lord Gareth Halloway’s son, and she’d known him. Known him and fed him and asked him to rid their village of the Mossfields. Years ago. And only now I came to make good on it and failed. He climbed into the loft and knelt at her side. She shrank from his touch but only for a moment. Soon he had gathered her into his arms and she wept into his shirt. She smelled of hay, horse and grain. Good, honest things, he thought. She’s made entirely of good and honest things and brave where I am not. “I’m sorry,” was all he could say. Through her tears, Tani punched him in the gut and cried harder, her voice interrupted by sobs. “You… you nobles are all… all sorry. All bl… bloody sorry. You take me da and your… your father put… put a sword to my grand…grandfather. We only asked… asked for your help!” The color paled from Paul’s face and his heart sank. He felt his stomach twist and bile rise in his throat. My father would never hurt a… A what? He asked himself that over and over. Would he hurt a commoner? My lord father loves to drink. She shoved him away and wiped at her eyes but they wouldn’t stop tearing up. He reached a hand out to her but she spit at it. “Nobles are just bloody liars!” she shouted and raced down the ladder and out the open doors. Paul sat there in the remnants of hay with the dust, looking down after her. My lord father is an honorable man, a good, brave man. Only now he wasn’t so sure. He’d sent his son to do something he’d been asked to do years ago. Sent his feeble, cowardly son to do what we all swore to do at birth. Protect the lowborn. Act honorably, be noble. Only he’d done none of those things and he began to wonder if his father had ever done them either. 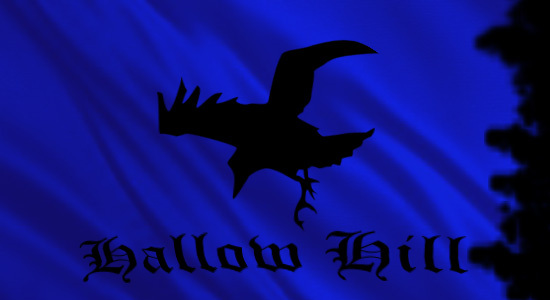 Hallowed Hill seemed suddenly barren of its glory to him, a dark mound of earth with dead men beneath it. Paul smelled smoke and he blinked as a crashing sound came from out in the yard. There was suddenly the sound of a horse and a man’s voice. He stood and was to the ladder when he heard Tani scream. Paul was down the ladder faster than he thought possible, sliding down more than climbing, and ran towards the sounds. This entry was posted in Fantasy, Original Fiction and tagged blog fiction, Fantasy, Hallow Hill, The Saga of Aranor. Bookmark the permalink.